The company was founded by Donald Wills Douglas Sr. on July 22, 1921 in Santa Monica, California, following dissolution of the Davis-Douglas Company. An early claim to fame was the first circumnavigation of the world by air in Douglas airplanes in 1924. In 1923, the U.S. Army Air Service was interested in carrying out a mission to circumnavigate the Earth for the first time by aircraft, a program called "World Flight". Donald Douglas proposed a modified Douglas DT to meet the Army's needs. The two-place, open cockpit DT biplane torpedo bomber had previously been produced for the U.S. Navy. The DTs were taken from the assembly lines at the company's manufacturing plants in Rock Island, Illinois and Dayton, Ohio to be modified. The modified aircraft known as the Douglas World Cruiser (DWC), also was the first major project for Jack Northrop who designed the fuel system for the series. After the prototype was delivered in November 1923, upon the successful completion of tests on 19 November, the Army commissioned Douglas to build four production series aircraft. Due to the demanding expedition ahead, spare parts, including 15 extra Liberty L-12 engines, 14 extra sets of pontoons, and enough replacement airframe parts for two more aircraft were chosen. These were sent to airports along the route. The last of these aircraft was delivered to the U.S. Army on 11 March 1924. The four aircraft left Seattle, Washington, on 6 April 1924, flying west, and returned there on 28 September to great acclaim, although one plane was forced down over the Atlantic and sank. After the success of this flight, the Army Air Service ordered six similar aircraft as observation aircraft. The success of the DWC established the Douglas Aircraft Company among the major aircraft companies of the world and led it to adopt the motto "First Around the World - First the World Around". Douglas adopted a logo that showed aircraft circling a globe, replacing the original winged heart logo. The logo evolved into an aircraft, a rocket, and a globe. This logo was later adopted by McDonnell Douglas, and then became the basis of Boeing's current logo after their 1997 merger. 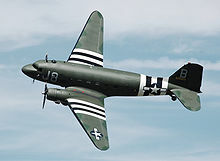 The company is most famous for the "DC" (Douglas Commercial) series of commercial aircraft, including what is often regarded as the most significant transport aircraft ever made: the Douglas DC-3, which was also produced as a military transport known as the C-47 Skytrain or "Dakota" in British service. Many Douglas aircraft had long service lives. Douglas Aircraft designed and built a wide variety of aircraft for the U.S. military, including the Navy, Army Air Forces, Marine Corps, Air Force, and Coast Guard. The company initially built torpedo bombers for the U.S. Navy, but it developed a number of different versions of these aircraft, including reconnaissance planes and airmail aircraft. Within five years, the company was building about 100 aircraft annually. Among the early employees at Douglas were Ed Heinemann, "Dutch" Kindelberger, and Jack Northrop, who later founded the Northrop Corporation. The company retained its military market and expanded into amphibian airplanes in the late 1920s, also moving its facilities to Clover Field at Santa Monica, California. The Santa Monica complex was so large, the mail girls used roller skates to deliver the intracompany mail. By the end of World War II, Douglas had facilities at Santa Monica, El Segundo, Long Beach, and Torrance, California, Tulsa and Midwest City, Oklahoma, and Chicago, Illinois. 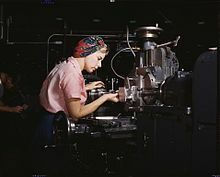 Machine tool operator at the Douglas Aircraft plant, Long Beach, California in World War II. 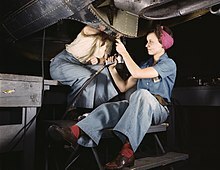 After losing thousands of workers to military service, American manufacturers hired women for production positions, to the point where the typical aircraft plant's workforce was 40% female. In 1934, Douglas produced a commercial twin-engined transport plane, the Douglas DC-2, followed by the famous DC-3 in 1936. The wide range of aircraft produced by Douglas included airliners, light and medium bombers, fighter aircraft, transports, reconnaissance aircraft, and experimental aircraft. During World War II, Douglas joined the BVD (Boeing-Vega-Douglas) consortium to produce the B-17 Flying Fortress. After the war, Douglas built another Boeing design under license, the B-47 Stratojet turbojet-powered bomber, using a government-owned factory in Marietta, Georgia. World War II was a major boost for Douglas. Douglas ranked fifth among United States corporations in the value of wartime production contracts. The company produced almost 30,000 aircraft from 1942 to 1945, and its workforce swelled to 160,000. The company produced a number of aircraft including the C-47 Skytrain, the DB-7 (known as the A-20, Havoc or Boston), the SBD Dauntless dive bomber, and the A-26 Invader. An ex-USAF C-47A Skytrain, the military version of the DC-3, on display in England in 2010. This aircraft flew from a base in Devon, England, during the Invasion of Normandy. Douglas Aircraft suffered cutbacks at the end of the war, with an end to government aircraft orders and a surplus of aircraft. It was necessary to cut heavily into its workforce, letting go of nearly 100,000 workers. The United States Army Air Forces established 'Project RAND' (Research ANd Development) with the objective of looking into long-range planning of future weapons. In March 1946, Douglas Aircraft Company was granted the contract to research on intercontinental warfare. Project RAND later become the RAND Corporation. Douglas continued to develop new aircraft, including the successful four-engined Douglas DC-6 (1946) and its last propeller-driven commercial aircraft, the Douglas DC-7 (1953). The company had moved into jet propulsion, producing its first for the U.S. Navy — the straight-winged F3D Skyknight in 1948 and then the more "jet age" style F4D Skyray in 1951. Douglas also made commercial jets, producing the Douglas DC-8 in 1958 to compete with the new Boeing 707. Douglas was a pioneer in related fields, such as ejection seats, air-to-air missiles, surface-to-air missiles, and air-to-surface missiles, launch rockets, bombs, and bomb racks. The company was ready to enter the new missile business during the 1950s. Douglas moved from producing air-to-air rockets and missiles to entire missile systems under the 1956 Nike missile program and became the main contractor for the Skybolt air-launched ballistic missile program and the Thor ballistic missile program. Douglas also earned contracts from NASA, most notably for designing the S-IVB stage of the Saturn IB and Saturn V rockets. In 1967, the company was struggling to expand production to meet demand for DC-8 and DC-9 airliners and the A-4 Skyhawk military attack aircraft. The company was also struggling with quality and cash flow problems and DC-10 development costs, as well as shortages due to the Vietnam War. Under the circumstances, Douglas was very receptive to an offer from McDonnell Aircraft Corporation. The two companies seemed to be a good match for each other. Although McDonnell was a major defense contractor, its civil aircraft business was almost nonexistent. Douglas would give McDonnell the civilian contracts it needed to weather any downturns in military procurement. On April 28, 1967, the two companies merged as McDonnell Douglas Corporation, headquartered at McDonnell's old facility in St. Louis, Missouri. Douglas Aircraft continued as a wholly owned subsidiary of McDonnell Douglas, while its space and missiles division became part of a new subsidiary called McDonnell Douglas Astronautics Company. McDonnell Douglas later merged with its rival Boeing in 1997. Boeing merged Douglas Aircraft into the Boeing Commercial Airplanes division, and the Douglas Aircraft name was retired after 75 years. The last Long Beach-built commercial aircraft, the Boeing 717 (third generation version of the Douglas DC-9), ceased production in May 2006. By 2011, the Boeing C-17 Globemaster III was the last aircraft being assembled at the Long Beach facility; the final C-17 was assembled in late 2015. However, as mentioned above, Boeing uses Douglas' former logo. ^ Parker 2013, pp. 5, 7–10, 13–14. ^ Haber 1995, p. 73. ^ Sobel 1974, p. 309. ^ a b Rumerman, Judy. "The Douglas World Cruiser - Around the World in 175 Days." U.S. Centennial of Flight Commission, 2003. ^ Wendell 1999/2000, p. 356. ^ "Douglas World Cruiser Transport." Archived 2012-06-25 at the Wayback Machine Boeing. Retrieved: 7 July 2012. ^ a b Francillon 1979, p. 75. ^ "Trademarks and Copyrights: Boeing logo." Archived 2012-06-21 at the Wayback Machine Boeing Trademark Management Group, Boeing. Retrieved: 5 July 2012. ^ Parker, Dana T. Building Victory: Aircraft Manufacturing in the Los Angeles Area in World War II, pp. 13-48, 77, 93, 107, Cypress, CA, 2013. ^ a b Parker 2013, pp. 13, 25, 35. ^ Parker 2013, pp. 2, 8. ^ Herman 2012, pp. 3–13, 335–337. ^ Parker 2013, pp. 7–8, 13, 25, 35. ^ Borth 1945, pp. 13–33. ^ RAND History and Mission. Accessed 13 April 2009. ^ a b Johnson, Stephen B. (2002). The United States Air Force and the culture of innovation 1945-1965. Diane Publishing Co. p. 32. ^ Boeing. "Last C-17 Built in Long Beach". Retrieved 29 December 2015. Donald, David, ed. Encyclopedia of World Aircraft. Etobicoke, Ontario, Canada: Prospero Books, 1997. ISBN 1-85605-375-X. Parker, Dana T. Building Victory: Aircraft Manufacturing in the Los Angeles Area in World War II. Cypress, California: Dana T. Parker Books, 2013. ISBN 978-0-9897906-0-4. Sobel, Robert. "Donald Douglas: The Fortunes of War". The Entrepreneurs: Explorations Within the American Business Tradition. New York: Weybright & Talley, 1974. ISBN 0-679-40064-8. Wikimedia Commons has media related to Douglas Aircraft Company.